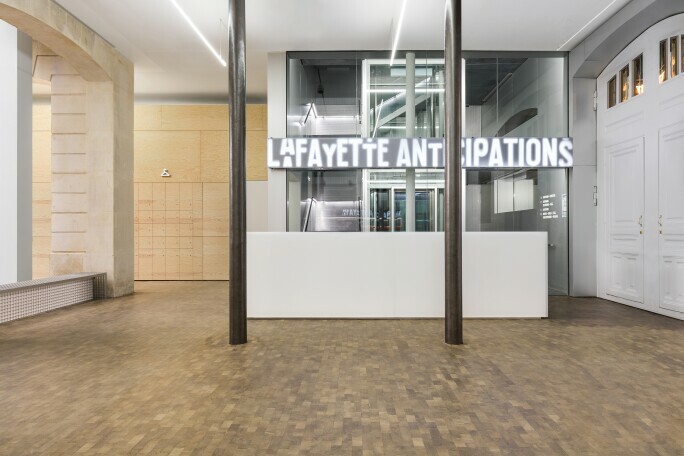 Lafayette Anticipations, a new foundation in the heart of Paris, is, as its name suggests, designed to exist in a state of constant expectation. Located amid the narrow medieval streets of the Marais quartier, this multidisciplinary arts centre and foundation opened to the public on 10 March. It is the first space of its kind in France; conceived not simply to present new visual and performing arts from around the world, but with the express purpose of offering artists the means to create. From all appearances, it has smartly equipped itself to fulfill that mission. Its genesis goes back to 2011, when Guillaume Houzé, the great-great-grandson of one of the co-founders of venerable Paris department store Galeries Lafayette, broached the idea of launching a cultural foundation to his father, Philippe Houzé, and grandmother, Ginette Moulin, respectively the chairman of the Galeries Lafayette Group and chairwoman of the group’s supervisory committee. “Initially, I didn’t have a particular idea of what the foundation should be, except that it should be useful to artists,” says Guillaume Houzé, who is 36. The president of Lafayette Anticipations, Houzé also serves as director of branding and communications at Galeries Lafayette and director of corporate patronage and public relations within the group, which includes Paris department store BHV Marais among other retailers. GUILLAUME HOUZÉ, THE FOUNDATION’S PRESIDENT AND GREAT-GREAT-GRANDSON OF THE FOUNDER OF GALERIES LAFAYETTE. PHOTOGRAPH © DELFINO SISTO LEGNANI AND MARCO CAPPELLETTI. Privately, Houzé is a serious collector focusing on contemporary artists such as Tatiana Trouvé, Wade Guyton, Ryan Gander and Tarik Kiswanson. Tall and fit, he is also a serious runner who has completed three of the world’s major marathons – Paris, London and Tokyo – and has Chicago, Boston and Berlin in his sights. “After I’ve done them all, I can retire,” he says lightheartedly during our chat the day before Lafayette Anticipations opened its doors for the first time. Workers were feverishly putting the finishing touches on the seven story building; the most whimsical and celebratory of which consisted in sprinkling glitter all over the space’s bois debout flooring (a type of contemporary parquet), a piece in the inaugural exhibition of artworks by American conceptual artist Lutz Bacher. 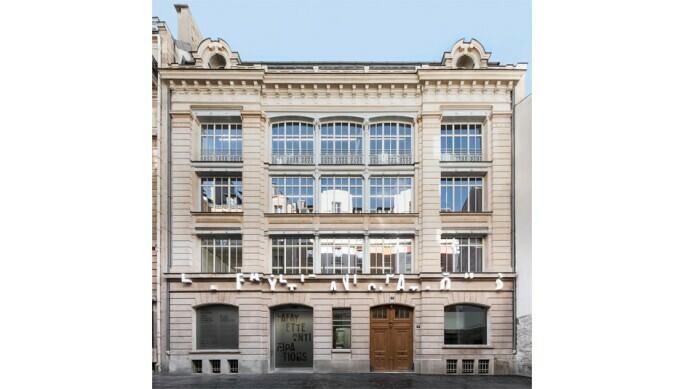 Located on the rue du Plâtre – once the epicentre of the city’s plaster trade – Lafayette Anticipations’ 19th-century building long ago served as a warehouse and straw-hat-making factory. And while its exterior is little changed, its interior has been transformed by the genius of Rem Koolhaas and his Rotterdam-based Office for Metropolitan Architecture (OMA), whom Houzé selected to renovate and reconfigure the space. Most impressively, the number of floors inside the original structure can change at any time: in a considerable feat of engineering, the building’s nineteen-metre-high central courtyard has been converted into what Koolhaas calls a “curatorial machine,” a steel- and glass-exhibition tower where platforms can hydraulically move up, down and nearly every which way – for a total of 49 configurations, to be exact – allowing the space to adapt to the needs of its diverse programming. THE LAFAYETTE ANTICIPATIONS BUILDING IN PARIS, DESIGNED BY REM KOOLHAAS. PHOTO © DELFINO SISTO LEGNANI AND MARCO CAPPELLETTI. To Houzé, Koolhaas was the natural choice for this project. “Rem is an architect of urbanism, as well as a great theoretician and journalist. He is linked to creation and retail,” Houzé says. “And I love the stores he has built for Prada, as well as his book, the Harvard Design School Guide to Shopping.” Notably, Lafayette Anticipations is the Dutch architect’s first building in Paris. Houzé clearly sees himself as continuing a tradition established by his great-great-grandfather, who moved from Alsace to Paris with a cousin in 1895, and first opened a small haberdashery on rue la Fayette. The success and expansion of their business – during a peaceful and economically prosperous time in France known as the Belle Époque – eventually led to the 1912 opening of the Art Nouveau-style emporium on boulevard Haussmann, which has long been reputed to be the second-most-visited landmark in Paris after the Eiffel Tower. “The store has always been about creativity and production,” says Houzé. “In addition to fashion, it produced furniture by the likes of Charlotte Perriand and Serge Mouille,” he adds, referring to two titans of French mid-20th- century design. To accomplish this, Koolhaas designed two subterranean floors offering an array of equipment, such as a state-of-the-art digital laser cutter and printer that can be used to fabricate large-scale pieces. Even before the building’s public opening, artists were working on pieces bound for shows at the nearby Centre Pompidou, Tate Modern in London and other museums. “What artists produce will be presented here, but not only here,” Houzé explains. THE ENTRANCE OF LAFAYETTE ANTICIPATIONS. PHOTOGRAPH © DELFINO SISTO LEGNANI AND MARCO CAPPELLETTI. Describing Lafayette Anticipations as “an incubator, a laboratory of innovation and experimentation helping artists express their creativity,” Houzé hopes to present three to four shows per year, with performances and workshop series peppered throughout. The inaugural exhibition, Lutz Bacher’s The Silence of the Sea (through 30 April) – her first solo show in France – has filled the building with sound, light, film and glitter. This summer, artists participating in The Centre Cannot Hold (20 June–10 September) will examine the concept of centrality – whether geographic, political or symbolic – and imagine potential responses to its challenges, bringing up inevitable questions about borders and migrations. Ambitious as it is, Lafayette Anticipations should remain intimate and “modest,” Houzé says, with capacity in its upper-floor galleries limited to 500 people at a time. But the ground floor promises to be a busy space integrated in the Marais’s bustling street life, with a boutique, À Rebours, selling unique contemporary objects, and an attractive café, Wild & the Moon, offering a vegan-only menu. All seems set to meet Houzé’s great expectations.